Hydraquip Hose and Hydraulics are looking to recruit and train 100 new Mobile Service Engineers. Being the leader when it comes to industry changes and operational efficiency, Hydraquip have created “The Hydraquip Way”. This is a joint training programme which both Hydraquip and the BFPA (British Fluid Power Association) have put into place to help both new recruits and existing staff become the elite and safest hydraulic engineers within the industry. Attitude is key to making a great impact both with your peers and customers. Therefore a positive attitude to learning and understanding “The Hydraquip Way” process can make a big difference to an individual’s skill, knowledge and safety. Steve Tomkins, one of the company’s Business Development Managers based from the Kettering depot, introduced and trained Stephen Holmes to “The Hydraquip Way”. Stephen joined Hydraquip from a mechanical services background, where he spent his time repairing and servicing construction machinery before becoming a CNC machine operator. Having not found his niche, Stephen approached Hydraquip with a desire to maximise his potential in an ever expanding company, with core values which matched the work ethics found at Hydraquip. Stephen was assigned “The Hydraquip Way” 6 week training programme. He received step by step training from his mentor Steve Tomkins to begin his career as an On Site Mobile Service Engineer. In addition to the hands on training, there are a number of tests which Stephen carried out online using multiple tick boxes throughout the full training period. To become a Hydraquip Mobile Service Engineer the training consists of 4 key stages which allow every trainee to complete each stage at their own pace. An introduction to Hydraquip’s work ethics and the history of the Hydraquip Group of Companies was given. Stephen was provided with his “The Hydraquip Way” training pack and supplied with the health and safety PPE equipment required for the role. Using an online training tool, Stephen completed all health and safety courses using simple multiple choice answers. Stephen was given a tour of his mobile workshop van and was introduced to the hydraulic hose assembly equipment and stock locations on his vehicle. Introducing and completely understanding thread identification and the manufacturing of hydraulic hose assemblies to manufacturer and BFPA standards. Completing on site assessments and visiting numerous machines in a variety of different scenarios is all part of the role. Stephen was given an introduction to on site hose repairs, watching his mentor safely remove faulty and failed hoses, learning how to identify the cause of the failure and overseeing the manufacturing of hydraulic hose assemblies on site with the appropriate fittings gaining experience along the way. Familiarisation and understanding of the challenges faced on site along with a general knowledge of a variety of machines from many industries. Stephen was provided with training on the Hydraquip engineer Job Manager mobile app. This app feeds the data entered by the engineer to the Hydraquip Job Manager portal which allows customers to view completed jobs online. Customers have the option of loading new jobs on to the same portal www.hydraquip.co.uk/jobmanager. 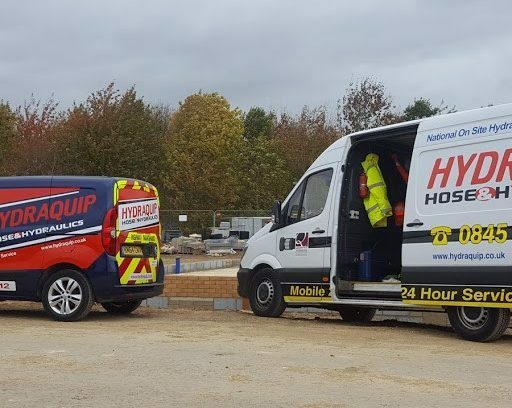 Hydraquip’s dedicated service team then distribute the job to their 24/7 national on site team. Stephen was shown how to accept any new jobs coming through from the service team and how to offer accurate ETA’s. Along with checking the risk assessments prior to commencing works on site. With such a positive outset, Stephen had clearly spent time reading through his training manuals helping him fast track through his training. Showing a hardworking and positive attitude, Stephen showed confidence and was able to complete his theory and hands on training on site within 4 1/2 weeks. For the remainder of his training, Stephen was introduced to sales and shown how to conduct himself in a professional manner using “The Hydraquip Way”. Learning skills and knowledge on how to identify prospect customers who would require breakdown assistance or those who would benefit from further group products and services too. Alongside the ad hoc sales and promotion, Stephen continued to spend time on site with his mentor identifying the cause of further breakdowns, followed by the first visit, first fix repair. Stephen has been attending on site call outs for several months now with no call backs to date. Hydraquip pride themselves in recognising an individual’s enthusiasm, personal skills & qualities, working with these to allow the individual to grow to their full potential.